CarolAnn Garratt giving her presentation. CarolAnn Garratt was our guest speaker for the Chapter’s August meeting. She gave an excellent presentation on her experiences flying around the world in her Mooney J in support of ALS research. CarolAnn’s mother had died from ALS in 2002 and her first circumnavigation was planned to raise awareness and donations for ALS research. CarolAnn began her flying activities in 1978 when she earned her private pilot certificate. She followed that in short order with her instrument and commercial certificates and bought her Mooney in 2000. She built her first airplane, a Rans S-7S, between 2004 and 2006 and took up soaring with a glider pilot certificate in 2004. Her first flight around the world was so successful that she planned another flight in 2009, this time to try and establish a new world record flight time. She was once again extremely successful with her efforts and was awarded the world record by the FAI, completing the flight twice as fast as the previous record. 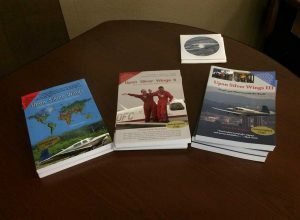 Books written by CarolAnn describing her around the world flight experiences. 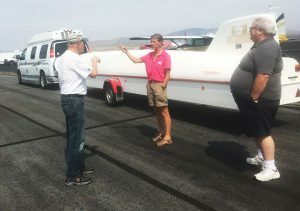 She described her purchase of her 200 HP Lycoming-powered Mooney, outfitting it with the extra fuel tanks and required equipment and the extensive planning to do an east to west circumnavigation of the globe in 2008. She anticipated the “Dash for a Cure” would utilize southern hemisphere tradewinds around the equatorial band during the most benign weather month of December. The record which she wanted to break was 54.6 mph, she wanted a minimum number of stops, however, her gas consumption was likely to be affected by 195 gallons of fuel, equating to 15% over gross weight. In addition, while she found that her maximum efficiency was at 6-8 thousand feet, her maximum distance per leg was sometimes perilously close to her total fuel consumption. She also had to contend with landing at foreign locations, with uncertain AVGAS availability and high landing and other fees, payable only in cash. She and her team did a 24 hour trip simulation at Oshkosh that year and it took a total of 18 months planning for the trip which took 8 days, 12 hours, 18 minutes and 53 seconds, for an average of 115.35 mph and generated over $300,000 for ALS research; and a new record. 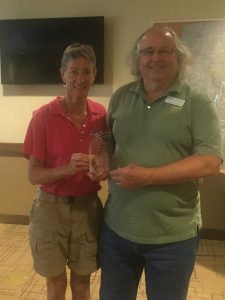 In April of 2011 she started a third around-the-world trip which ended in March of 2012, planned with stops to see places that she hadn’t previously seen so that she could experience the places she had flown over twice before, meet new people and give her presentation to various aviation organizations. Her world flights have generated $427,100 in ALS research donations. There are now Phase II clinical trials underway, a new drug was approved by the FDA. There is a DVD available online at alsworldflight.net. Chapter President Tracy Rhodes giving CarolAnn our Chapter 1361 speaker thank-you gift. 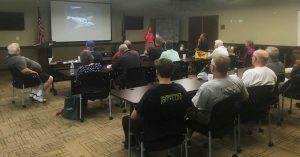 She stayed after the meeting and answered individual questions which had not been given voice during her presentation, and had her three books available which describe her aviation experiences in detail. All proceeds from her book sales go directly to ALS research. CarolAnn’s traveling set-up with her glider trailer. Next stop, Truckee, CA.